Corgi. PAPERBACK. 0552134619 Book is in good condition. Cover has some wear. -- Re-Read is a social enterprise that trades in and recycles books to reduce waste, save them from landfill and provide services and activities that promote literacy, education attainment and quality of life in South Yorkshire and supports Askern Community Library. All overseas shipping is via Airmail. . Good. 1990. Corgi. PAPERBACK. 0552134619 The book is in good condition. Pages are intact and not marred by notes or highlighting. The spine remains intact. Some page discolouration and creasing to the cover. -- Re-Read is a social enterprise that trades in and recycles books to reduce waste, save them from landfill and provide services and activities that promote literacy, education attainment and quality of life in South Yorkshire and supports Askern Community Library. All overseas shipping is via Airmail. . Good. 1990. Corgi Books. Used - Good. Shows some signs of wear, and may have some markings on the inside. Corgi. PAPERBACK. 0552134619 Book is in good condition with typical reading wear to cover and spine. Pages are yelllowing. Fingermarks maybe present. -- Re-Read is a social enterprise that trades in and recycles books to reduce waste, save them from landfill and provide services and activities that promote literacy, education attainment and quality of life in South Yorkshire and supports Askern Community Library. All overseas shipping is via Airmail. . Good. 1990. Reprinted paperback edition in very good condition with light vertical creases to spine and minor wear to cover. Edges and pages clean and clear. Shop stamped,no inscription or other writing throughout. Appears gently read. London: Corgi Books, 1996. Reprint. Paperback. Very Good. Reprinted paperback edition in very good condition with light creasing to spine and minor wear to cover,lightly creased Edges and pages clean and clear. No inscription or other writing throughout. Appears gently read. Corgi Adult, 07/01/1990. Paperback. Used; Good. **WE SHIP WITHIN 24 HRS FROM LONDON, UK, 98% OF OUR ORDERS ARE RECEIVED WITHIN 7-10 DAYS. We believe you will be completely satisfied with our quick and reliable service. All orders are dispatched as swiftly as possible! Buy with confidence! London: Corgi Books, 1997. An uncreased spine with very light edge rubbings. No store stamp.. Later Printing. Paperback. Very Good +. Corgi, 1993. Paperback reprint. VG.. Soft Cover. Very Good. Corgi. PAPERBACK. 0552134619 Brand New ,Original Book , Direct from Source , Express 5-8 Business days worldwide Delivery. . New. Great Britain: Corgi, 1992. 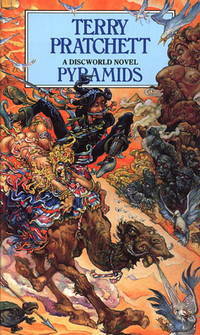 Paperback (Discworld Terry Pratchett) We carry a wide selection of titles in The Arts, Theology, History, Politics, Social and Physical Sciences. academic and scholarly books and Modern First Editions ,and all types of Academic Literature.).. Reprint. Softcover. Very Good. 12mo - over 6¾" - 7¾" tall. Paperback. Corgi. PAPERBACK. 0552134619 . Good. Great Britain: Corgi, 2004. 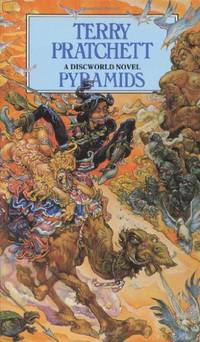 Paperbacknew black cover design (Discworld Terry Pratchett) We carry a wide selection of titles in The Arts, Theology, History, Politics, Social and Physical Sciences. academic and scholarly books and Modern First Editions ,and all types of Academic Literature.).. Reprint. Softcover. Very Good. 8vo - over 7¾" - 9¾" Tall Octavo. Paperback. Corgi. PAPERBACK. 0552134619 . Very Good.